Please go to my Etsy site to view stock available. hawthornecottage.etsy.com You can place an order by sending me a message on this site (email address at bottom of page) or you can send a message through Etsy. I have more colours available. 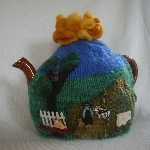 I am happy to email photos of other tea cosies, hats etc.